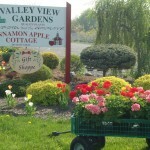 Memorial Day At Valley View Gardens and The Cinnamon Apple Cottage Gift Shoppe! MEMORIAL DAY IS JUST AROUND THE CORNER and WE ARE STOCKED AND LOADED! You’re not ready? Don’t panic! There is still time to add gorgeous, flowering shrubbery, trees and perennials to your garden or deck, giving your landscape just the sparkle it needs! We at Valley View Gardens Retail Nursery and The Cinnamon Apple Cottage Gift Shoppe will help you enhance your home with elegant touches for the inside and outside just in time for Memorial Day. We can also help you remember your loved ones this Memorial Day with an arrangement of annual flowers in your urn or in our pottery. Truckloads of ZERRILLO’S locally grown, superior hanging baskets and annuals arrive every week just in time to help you decorate your memorial planter for those who have gone to their rest after serving our country. Are you planning an edible garden? Refreshing selections of hearty vegetable and herb plants await you at Valley View Gardens, as well as a variety of organic vegetable plants. 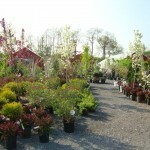 Blueberry bushes and fruit trees are abundant at Valley View Gardens, so come and make your selections while they last! There is no time like the present to start your garden! If you need a unique gift but are not exactly sure what to buy, we can help you! Delight your friends or loved ones with a popular Gift Certificate from Valley View Gardens and The Cinnamon Apple Cottage Gift Shoppe. Let your friends choose for themselves the items that most please them! Our attractive Gift Certificates can be used to purchase items inside the gift shop OR plants outside in the nursery. Best of all, they will never expire and will be there just when your loved is ready to choose something they will treasure! They are the perfect expression of how much you care! The time has come for you to treat yourself to that lovely tree or gorgeous shrub you have admired in your neighbor’s yard for years or that home decoration you spotted a while back. Indulge yourself! 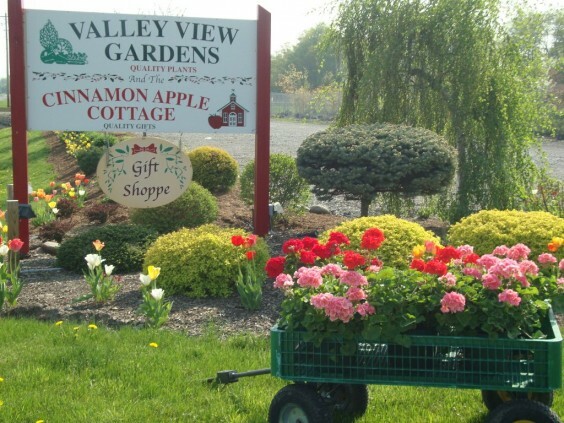 Valley View Gardens Retail Nursery, The Cinnamon Apple Cottage Gift Shoppe AND a fantastic shopping experience are waiting for you at 3797 Luker Road in Cortland! Truckloads of stunning plants and eye-catching giftware have just arrived, including many new items and varieties! Whether you desire quality plants or professional expertise to help with your landscape design and installation, Valley View Gardens can provide both to your complete satisfaction. In addition to our forty years experience designing and installing beautiful landscapes, we are able to use that same expertise to advise “do-it-themselves” gardeners by steering them in the right direction. 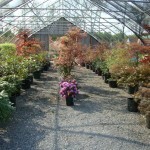 Finding the right plant for a particular environment is our specialty! In addition to twenty-two years elsewhere, we have been in business for eighteen years in Central New York, including six years at our present location on 3797 Luker Road, in Cortland. For your convenience, we are located ‘just around the corner’ on Luker Road, less than a half mile from Route 281, opposite Builder’s Best Do-It-Center. 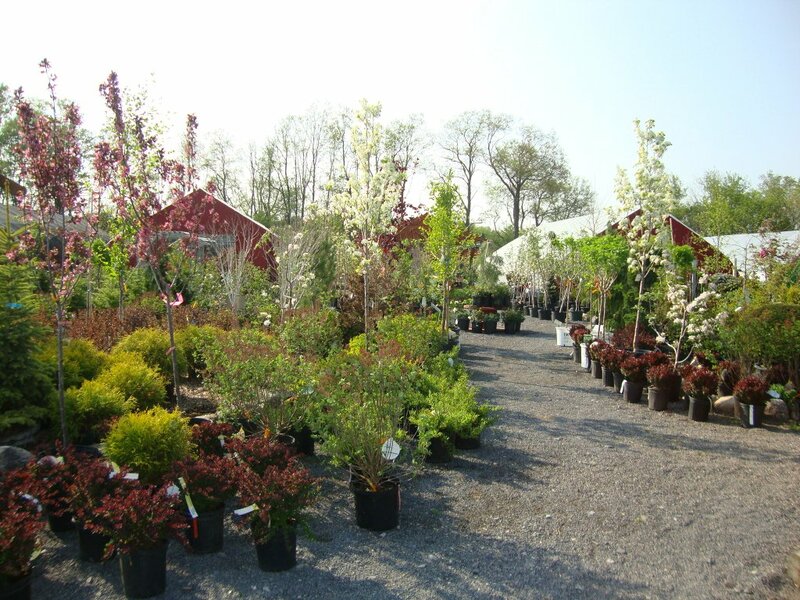 You will be amazed at the quality and variety of our selection of shrubbery, shade trees, fruit trees, ornamental trees, topiaries and more! Valley View Gardens will provide a stronger, healthier plant than can be obtained in department store garden centers and our convenient location eliminates those costly trips out of town, ensuring a savings to you! For a splash of color, choose from the gorgeous flowering annuals and hanging baskets that fill our greenhouses. If you have a niche to fill in that sunny or shady corner of your garden, we have an impressive assortment of perennials located in our perennial houses and outdoor displays that will do perfectly. Are you looking for that unique ornamental grass that has caught your eye? We have many varieties from which you can add texture and motion to your landscape! 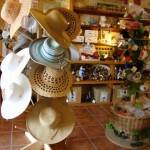 The Cinnamon Apple Cottage is a unique gift shop located adjacent to Valley View Gardens. 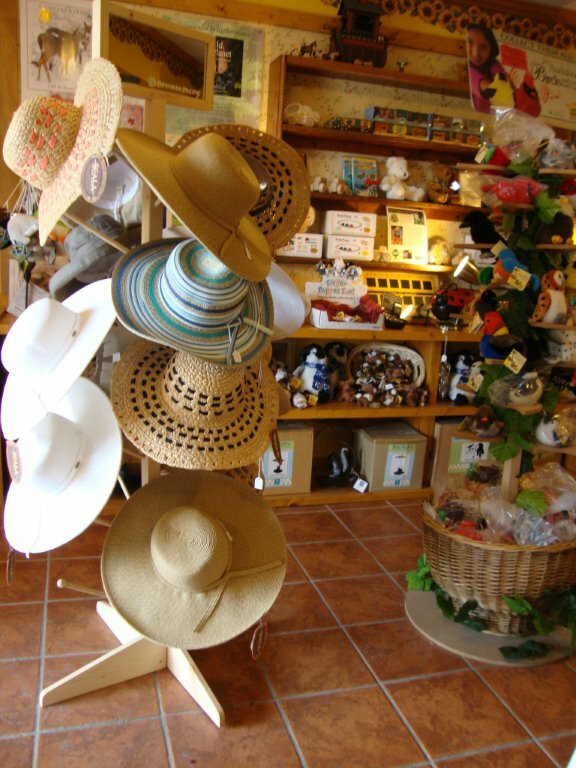 Time and again we have been told by our customers that they love to shop in our ten-room store. The lovely music of Scott Adams, born and raised in Groton, as well as the romantic instrumentals of composer/pianist Stuart Dudley are sold here and can be heard throughout the shop and the nursery, creating a delightful backdrop for your shopping experience! Each room has its own ambience and related product lines. 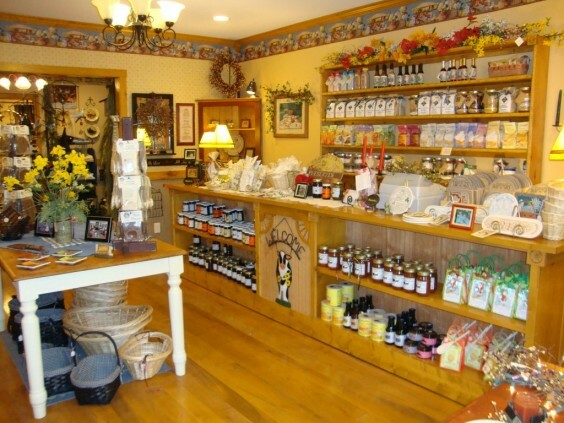 Floral decorations, fragrant candles and potpourri, art work, whimsical figurines, children’s books and toys; outdoor décor and gift items; Amish jams, fruit butters, pie fillings and soups; delicious scone and bread mixes and much, much more! If you need a pick-me-up for yourself or your friends and loved ones, you are sure to find it at The Cinnamon Apple Cottage Gift Shoppe. Our springtime hours have begun! We will be open Monday through Friday, 10 to 6 o’clock; Saturday, 9 to 5 o’clock and for your shopping convenience, Sundays, 10:30 – 3:30 (through July 3). We will also be open on Monday, July 4th from 10-2 o’clock! 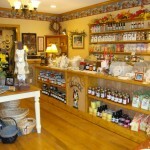 Stop in and shop at our retail nursery and gift shop. Better yet, call Dan, Andrew and Pat Mones at 607-749-3130 to set up a consultation to help your landscaping dreams come true! 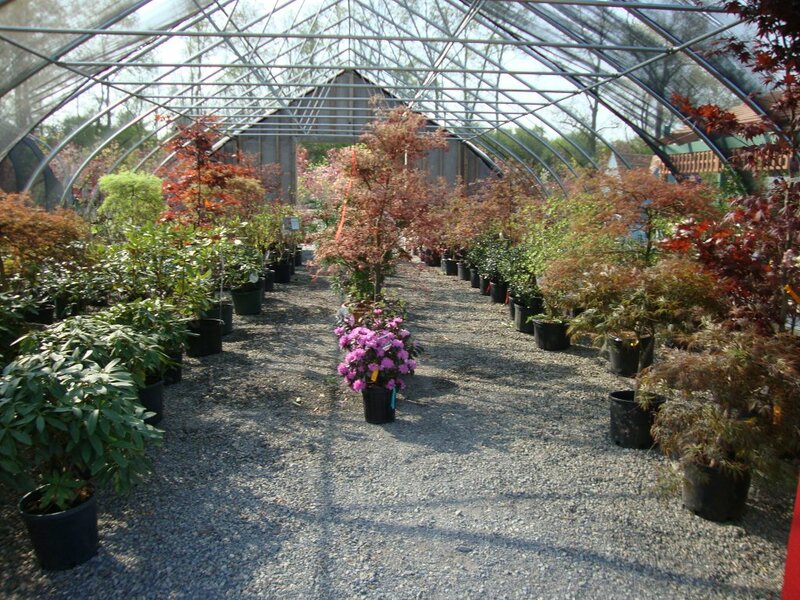 You will be glad you came to Valley View Gardens on Luker Road in Cortland! We look forward to meeting and serving you! See you then!